we have a birthday tradition at work, a fun takeout lunch and cupcakes. not elaborate but sweet and really nice. and i bet you're not shocked when i tell you that i always make the birthday cupcakes. well this week was our fearless leader's birthday and we wanted the cupcake flavor to be a surprise so we sought the advice of our leader's adorable daughter with a sneaky text message. so covert, we could be spies i tell you! and the verdict, salted caramel. fabulous except i've never made salted caramel, in fact i've never even had one. 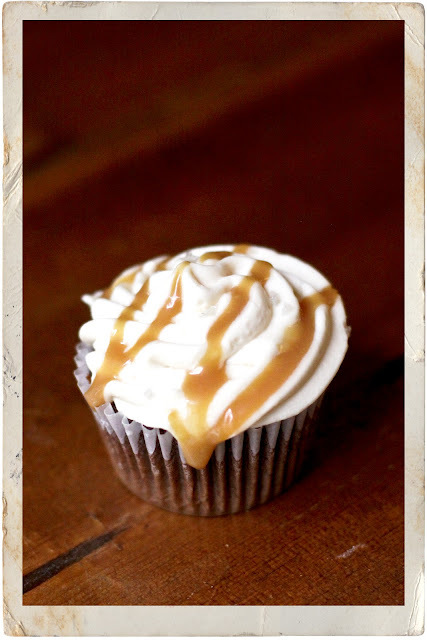 hard to believe that with the millions of cupcakes i've eaten that i've never tried a salted caramel one but it's true. (yeah i said millions but this is a judgement free zone, thank you). so that's where the amazing brown eyed baker comes in. i found her site thanks to pinterest and her recipe didn't disappoint. the birthday girl (and everyone else, including me) enjoyed the cupcakes very much! it's a great chocolate cupcake recipe, very moist and not too rich which is perfect with such a sweet frosting. and a great caramel frosting too, however i have to admit i cheated on the caramel. after burning my first 2 batches of caramel, i melted a bag of kraft caramels, added some cream & pretty grey salt and ta-da, had my salted caramel sauce. apparently learning to make caramel sauce from scratch is going on my 2013 list. Oh my word Carly! I am licking my screen right now! Your lucky, lucky co-workers. This looks divine! Nice job lady! Yum!!! If those taste even half as good as they looked.... sounds dangerous is all I'm going to say! And I love that you've eaten millions of cupcakes... here's to billions!